I am currently sitting in a cabin in the Icelandic north, recovering from a 3 day trek round the Highlands. As well as a sore backside and achy limbs(! ), this incredible experience has also given me a brand new outlook on the way we keep our horses back at home. This trek was no ordinary ‘hack’ – two Icelandic horses each (one hand-horse), through gushing rocky rivers, between steep mountain passes, over terrain that at first glance seems unpassable- constant rocks, slippery slopes, narrow cliff edge paths, flat ground a rare luxury – the type of terrain that at home would make you instantly turn back for fear of an almost-certain pulled tendon, trip or fall. We headed through it all relaxed in the knowledge that our horses would cope and get us home safe. But these Icelandic horses were not born with this innate ability and confidence- they LEARNED it, by being allowed to grow in a more natural way. This doesn’t mean they were never handled as youngsters – quite the opposite. A lack of human contact would remove all respect when they were then relied upon as riding horses. They are well-handled on the ground before even being sat on. The difference comes from the trust given to the natural instincts possessed by all horses when not in the company of humans. Raised in herds on relatively unmanaged pastures, they have the space to move, forage for food, and explore. Turn-out is not merely a rectangular space with a seeded ‘lawn’ and a bucket of water – it is left bumpy, rocky, with natural dips and hills, streams and rivers. These horses obtain advanced proprioceptive ability by following their mothers on difficult terrain – trips and stumbles at this age building a solid foundation of sure-footedness in later working life. Confidence is built from being in a natural herd environment and from a respect of the humans who put them there, and who intervene only when necessary. With the luxury of space, the horses also have the opportunity to escape conflict and learn vital independence, all adding to their ‘hardy’ nature. These horses are treasured by their humans – they are highly respected, but never mollycoddled. Grooming is functional, management is simple, expectations are high. But the horses are clearly happy, healthy and fulfilled. 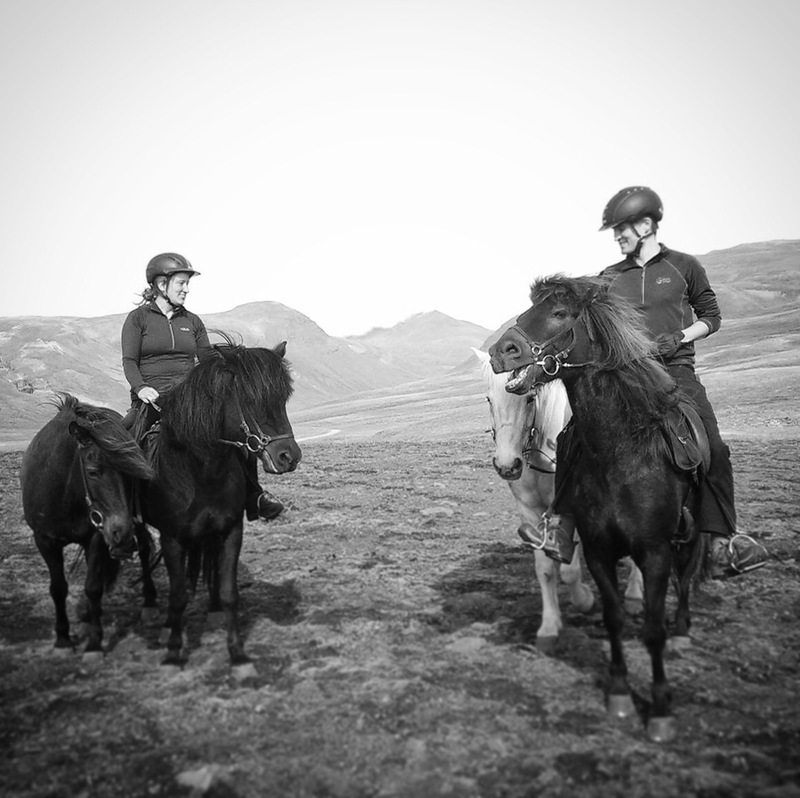 Obviously, not all horse-owners have this availability of space and variety of terrain offered in Iceland! But maybe some lessons can still be learned, and imitated where possible. Maybe opt for that paddock that nobody else wants – large, slopy, rocky, perhaps with trees for shelter and a stream or ditch- invite like-minded owners with suitable horses to join you to form a herd – take down that dividing tape that always falls down anyway ;). Given the space to be alone as needed, perhaps even less affable equines could find their place and gain confidence from being a member of a more natural herd. Allow youngsters to explore and learn both with and without their humans – challenge them and expose them to the world beyond their rectangular grass limits. They ARE capable – we just have to allow them to learn, and not wrap them up (quite literally in some cases!) in cotton wool. What a wonderful experience Kate. They are allowed to be horses right from the beginning and are happy and contented with a job to do. Lucky animals!